Chocolate Peppermint Truffles. This time of year makes me think of chocolate. So how about some chocolate peppermint truffles? Truffles, cookies, brownies to name a few. It seems like there are always sweet treats going around at parties. I have been trying to come up with cleaner versions. This chocolate peppermint truffle recipe is another one of those. Only 4 ingredients and just a few minutes! I got the idea for these peppermint truffles after making my Chocolate Pistachio Truffles. 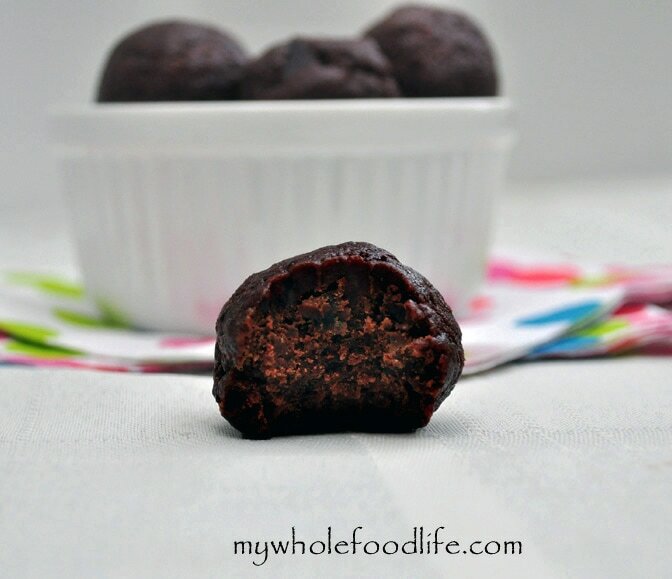 These healthy truffles are so good and they just melt in your mouth. The best part? They can literally be made in minutes! I used to think truffles were hard to make, but this recipe proved me wrong. It couldn’t be easier. In a food processor , combine all the ingredients and blend until a dough starts to form. Store in the fridge to firm them up. About 20 minutes. I got 10 truffles out of my batch. Enjoy! Love this idea! I'm making these on Wednesday when I get home from my trip. Thanks for helping with my clean eating goals. My sister and I love your website! You are so welcome Liz! I hope you enjoy this recipe! I want to try these so badly! My problem is no matter how many of your recipes I try with dates in the food processor, I can never get the paste consistency you describe. I just get smaller dices, or chunks. While it doesn't hurt the flavor (they taste delicious! ), the texture is waaaay off and much more crumbly, obviously. What am I missing? Am I not processing them long enough? Help! Maybe your food processor isn't strong enough? Some aren't. You can try soaking the dates in water for 10 minutes prior to using them. That should help soften them up a bit. I was wondering if that was the problem...it's not terribly powerful :( The soaking may be just the trick! Thanks so much! I've really enjoyed finding your website and trying your recipes. My husband has a chronic GI problems and these recipes are treats that he can actually have and don't taste like cardboard. Thank you for all your hard work! You're welcome Amber! I hope that works out for you. Let me know. I tried soaking the dates, with measured success. I now have a new, more powerful blender (Merry Christmas to me!) and after trying again, it was perfect!! I was so excited to get the fudgy, rich, cake texture, delicious! Thanks again. Chocolate and mint is one of the best combinations in the world! These look amazing - and so simple to make! Could you just use date sugar instead? Already have it on hand so I thought I'd ask? Great recipe! I'm not sure. The dates help with the binding. If you try, let me know how it works out. Can't wait to make these once I'm off the candida cleanse! I love the chocolate-mint combination - and SO simple! Would coconut or peanut butter work? I have both of those! I think coconut butter would be fabulous! I made these yesterday and they were amazing ! Thank you so much for the recipe. I use sunmaid dates and just add a few more as you suggest. Sometimes my mixture isn't moist enough to bind together so I just add a T. of water or so and it turns put perfect . They do need to be refrigerated. Then again, I have never tried leaving them out? Maybe you could make a batch to experiment and see if they last outside the fridge. I would be interested in the answers. Made these last night with almond butter and sunmaid dates and they are so good! They remind me of the girl scout thin mints. Very delicious! I can see a Christmas goodie box forming from all your no bake bites....:) Thanks for the great recipes and keep up the good work!! You're welcome Wendy! Thanks for making my recipes. Glad you enjoy them! Have you ever made these with food grade peppermint oil instead of extract? Never tried, but I am sure it's possible.